Greekfest season is coming to an end! 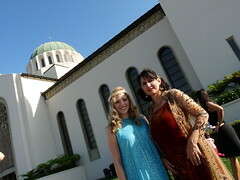 This past weekend, the LA Greekfest wrapped up with Salsa Night at St. Sophia Cathedral. As always, the atmosphere was fun, but the food left a lot to be desired. If you missed last weeks festivities and still want to attend a Greekfest this year, the Pasadena Greekfest is this weekend. The Hellenic Festival at St. Anthony Greek Orthodox Church runs September 18 – 20 and has a jam-packed schedule of shows, tours and exhibitions. Admission is $3 and children 12 and under are free. Street parking is available. Despite being at a smaller church, the Pasadena Greekfest seems much bigger, perhaps because there’s a lot more particapatory activities than there are shopping booths. For what it’s worth, the bonus of the Pasadena Greekfest is that the food is cheaper and definitely better than at the LA Greekfest. You can see more of my photos of the LA Greekfest on my flickr page. Previous PostPrevious Win Tix to Psychedelic Furs & Happy Mondays this Friday!